More Americans disapprove than approve of how Mr. Obama is handling relations with Iran. Americans overwhelmingly favor (82 percent) the deal reached between the U.S. and Russia for Syria to turn over its chemical weapons. Americans still would not support airstrikes against the Syrian government, even if Syria fails to comply — an option that the U.S. says remains on the table if the diplomatic solution ultimately fails. Underlying these views, a large majority (68 percent) continues to believe in principle that the U.S. doesn’t have a responsibility to do something about the fighting in Syria. As was the case earlier this month, majorities of Democrats and Republicans don’t view this as a U.S. responsibility, and there has been little shift in the public’s views about this in recent weeks, or over the longer term. Most Americans don’t differentiate in how civilians are killed: 68 percent say the international community should respond to all civilian killings the same, while 25 percent say civilian killings from chemical and biological weapons warrant a stronger response than killings using conventional weapons. The president’s rating on foreign policy overall is more negative than in July, before the escalation of U.S. involvement in the Syria crisis. Just 40 percent approve of his handling of foreign policy, while 49 percent disapprove – the highest disapproval he has ever received on this measure. 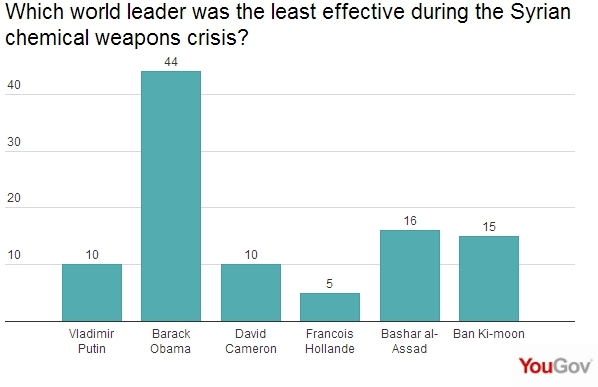 It’s not because Americans particularly like Russian or Arab leaders. Rather, it’s because Americans want to avoid another war. The Syrian leader agreed to give up his chemical weapons, and the Russian leader brokered the deal. Obama, on the other hand, wanted war, and was dragged kicking and screaming to the negotiating table. 58% oppose action. Even if Syria fails to abide by the agreement, few Americans favor military action. Only 28% say they would support a military strike by a coalition of countries that included the United States. A new German Marshall Fund of the United States finds even higher levels of opposition against a war in Syria. 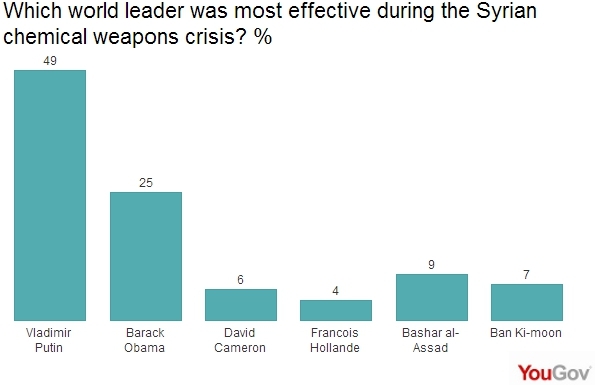 Indeed, Americans oppose arming the Syrian rebels … even if we keep our own troops out of the war. A September 2012 poll conducted by the Chicago Council on Global Affairs showed overwhelming opposition to the idea of attacking Iran among American voters, with 70 percent saying they are opposed to the idea of a unilateral US attack on Iran. And that was before the new moderate Iranian leader started negotiating a nuclear deal. The truth is that Americans have been sick and tired of war in the Middle East for years.